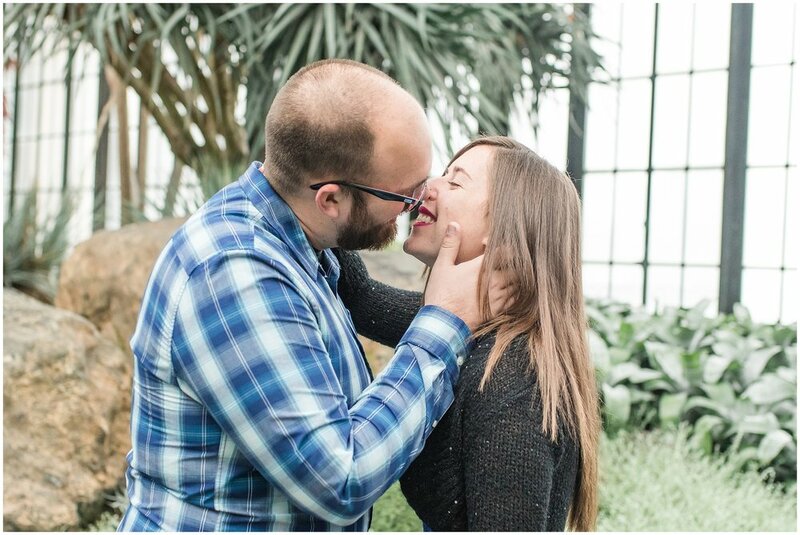 I have so many wonderful things to say about Melissa and Grant that I could just go on forever so stick with me while I try to make this short and sweet so you can enjoy their images! Grant and my husband, Kyle, played high school football together and when I saw his name on the inquiry Melissa sent, I was so happy! These two are KILLIN' IT. They are both graduate students at Baylor University and plan to become statistics professors (hopefully at the same college or university)! They currently live in Waco, Texas (I'm going to come visit guys!!! hahaha) and are planning a Pennsylvania wedding on Grant's family property. I'm so excited for this really special day and now that I've heard their really fun, down-to-earth vision, I'm even more pumped. 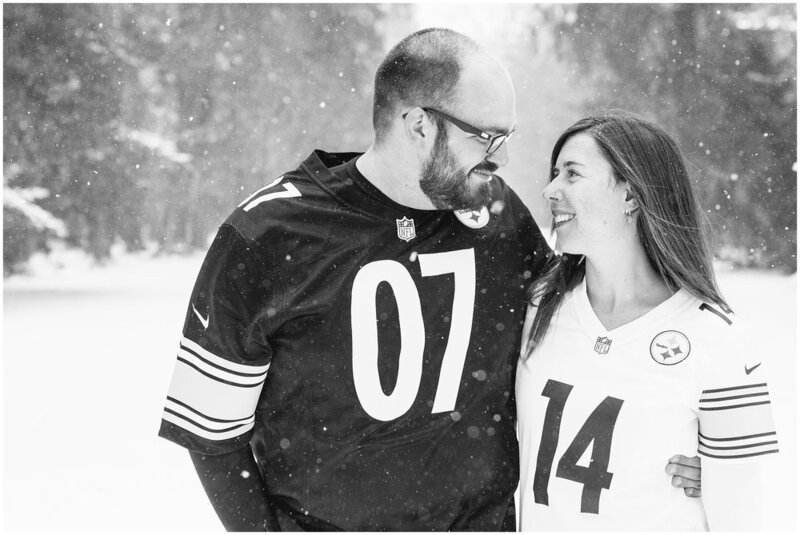 Melissa had never seen snow and really hoped for a snowy engagement session. WELL. Boy, did Mother Nature deliver. I was so nervous because the storm that was coming in on the day of their session was originally forecasted to not be that bad in our area. But that bomb cyclone moved in a little farther west of the coast than originally predicted and the roads were terrible. I made it to Longwood Gardens and we had the place entirely to ourselves... I kid you not. Sometimes I'm shooting couples there with crowds of thousands of other guests. IT WAS EMPTY. I know that will never happen again unless I venture there in another blizzard. It was a magical experience and I hope you enjoy some of my favorites from their session! 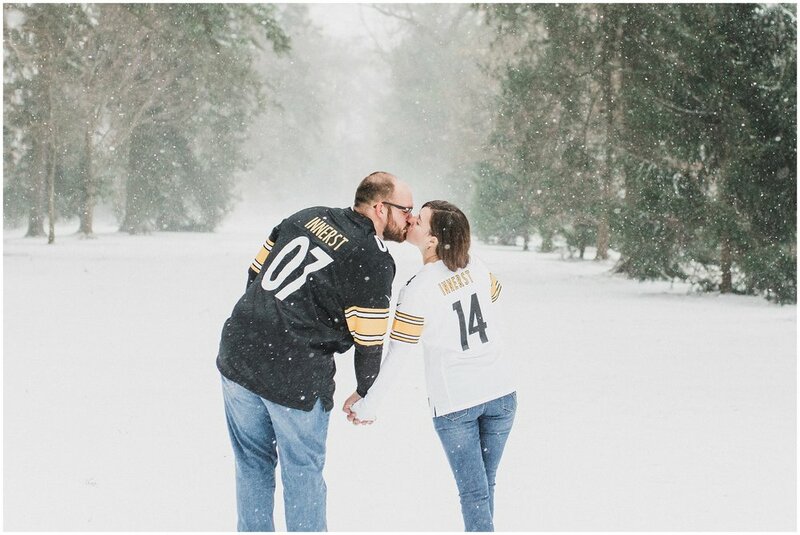 Grant and Melissa brought custom Steelers jerseys with his last name and their wedding date! And when we were finished our session Melissa said, "I didn't realize snow was this cold! Everyone looks so cute in the movies when it's snowing." God love her. Such a trooper during this storm!